OMG – Oh! May! God! 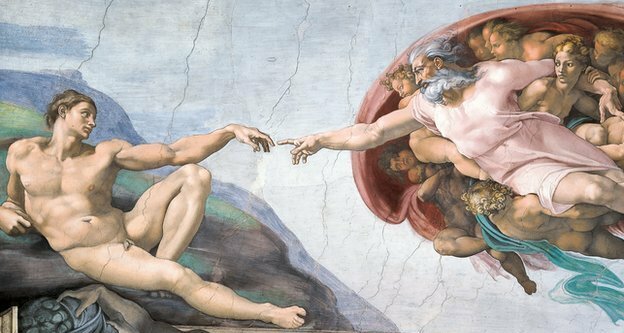 Today I post Martin Rowson’s re-intereptation of Michelangelo’s iconic image of “The Creation of Adam” on the ceiling of the Sistine Chapel – with a few comments on the story that inspired the work. Theresa May has described how her faith in God makes her convinced she is “doing the right thing” as Prime Minister. This week Theresa May gave one of her (thankfully) rare interviews to the Sunday Times. 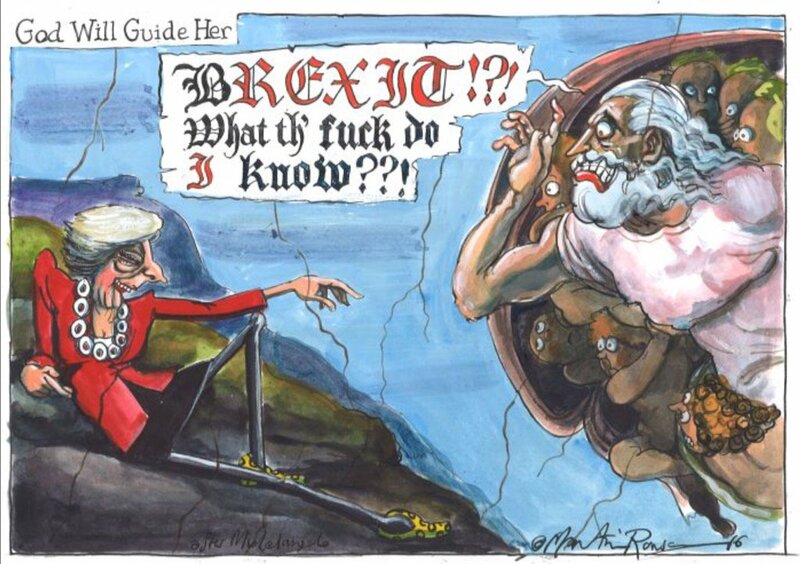 The above art referencing cartoon is Martin Rowson’s inimitable take on her claim that her faith in God is her driving force. The comments were made as Ms May admitted to The Sunday Times that it was the “hugely challenging” task of Brexit which left her with little time for sleep. The Christian Post goes further and says “May added that her faith in God shows her she’s “doing the right thing” as the U.K.’s leader, and is how she copes with what she called the “hugely challenging” task of negotiating Brexit. Can anyone imagine how the Press, and a great deal of the public, would react if Sadiq Khan said he was going to ask Allah where to put London’s new runway? To be fair to Theresa May, she could have been misquoted. Maybe the reporter said “Just what is the plan for Brexit?” and she said, “God knows”. Michelangelo, c.1512, Fresco, 280cm x 570cm, Sistine Chapel ceiling, The Vatican. Well done Martin, I think you’ve caught the spirit. This entry was posted in Referential Cartoons and tagged Martin Rowson, political cartoons on November 30, 2016 by Chris Walker.